SOUTHINGTON - As Sal Conti watched three of his students take part in the American Poolplayers Association’s Junior Championships earlier this summer, he couldn’t help but feel a sense of pride. 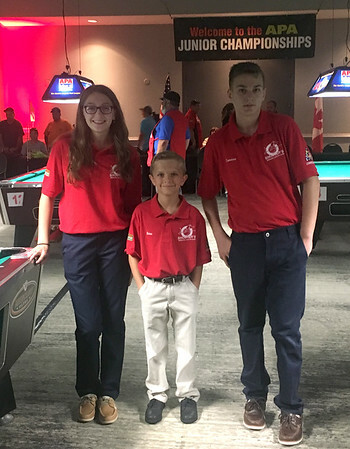 Not only had 18-year-old Cameron Johnson, his 16-year-old sister Taylor and 10-year-old Brian Marek III showed off their skills at the junior national event at the Renaissance Hotel in St. Louis, they did so in a way that, as Conti put it, was more mature than their ages. “I watched match after match after match and was so proud with how they carried themselves with such calmness,” said Conti, the owner of Shooters Billiards and Arcade in Southington and a coach at the Connecticut APA Junior Academy. “These are kids, and to carry themselves the way they did - they shook their opponent’s hand before the match, after the match and acted the same whether they won or lost - that’s hard for adults to do. The Junior Championships were a double-elimination 9-ball tournament with brackets based on skill level, not age, routinely putting the trio up against opponents who were more experienced. In just his second full year playing billiards competitively, Cameron Johnson, who won the Connecticut APA Junior Championship in May, placed fifth nationally. But for Cameron Johnson and his family, pool offers him more than a chance to compete in tournaments. Cameron is autistic and in billiards, his mother Connie said, he’s found a place he fits in and belongs. At the national championships, Cameron Johnson made quick work of his first four opponents - one win came in just a minute and 30 seconds - before losing a closely contested quarterfinal match to the eventual champion when the 9-ball teetered on the pocket, but didn’t go in. Having turned 18 in March, Cameron Johnson will move on from the junior circuit and will be playing with adults. He currently plays in 8-ball and 9-ball leagues at Shooters. Cameron’s sister, Taylor Johnson, participated in the event after placing third in Connecticut. In her third year as a member of the APA Juniors, she took 65th in her division after rebounding from an opening-round loss. Strong in the classroom as well, Taylor Johnson was one of 40 students honored with an academic achievement award for her grades. Marek had quite a first year in the Junior Academy. After finishing second in the state in his division, he placed 33rd in St. Louis out of 198 players. What made Marek’s run quite special was he often went up against and beat players who were older, including a 13-year-old and a 16-year-old. Marek ended up losing to a 16-year-old to finish his time in St. Louis with a 4-1 record. But none of the results came as a surprise to Conti. That part goes back to the Junior Academy, which was founded by Bruce and Ann Barthelette. Now in its third year, the academy had 22 students this season, ranging from age 7 to 18. The group meets the first Saturday of each month from September to May. The Junior Academy resumes Sept. 8. For parents interested in the program, there will be an informational meeting at Shooters on Monday, Aug. 27, at 7 p.m. For more information about the Junior Academy or the Connecticut APA Pool League, call 1-888-APA-POOL. Posted in New Britain Herald, Southington on Wednesday, 15 August 2018 20:02. Updated: Wednesday, 15 August 2018 20:05.